Not since April Fool’s Day 1979, at a Motörhead gig at the Lyceum in London, have we (well, M actually) experienced such a cacophony. 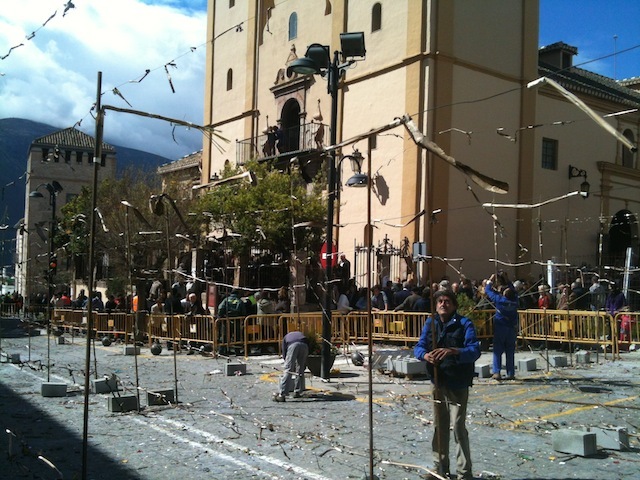 As part of Semana Santa – when the statue of Cristo de la Expiración at the altar of Órgiva’s church is removed and carried around town – there are fireworks; very, very loud ones. Today, a 100 metre-long rig of bangers, some so loud the road shook beneath our feet, were strung across the street outside La Iglesia de Nuestra Señora de la Expectación. There’s been a bit of rain recently but by noon blue skies had appeared and the crowds gathered for what is one of the town’s annual highlights. At first we hung around the rubbish bins while others, in their best attire, packed into the church where a band played mournful music. S retreated to ‘get a better view’ further away down the street – behind an ambulance. The town’s dogs – and there are many – were nowhere to be seen. Here’s a very short clip of the bangers, which went on for several minutes. You may wish to turn the volume down. There are more tomorrow around 6pm. The title of this post – A bang on the ear – is of Celtic origin meaning a kiss or pat on the ear or cheek. The complete opposite of what we experienced today. It gives us an excuse to play the song of the same name by The Waterboys. Ah, Orgiva’s Big Bang. It’s quite a thing to watch the smoke rising above the town from from a safe distance up the hill. And it is a bit easier on the ears. During Cristo last year I had just picked the little one up from Guardaria in town when the traffic got stopped for the midday blast. We were close to the church and I thought she was going to have a meltdown (as with previous experiences of fiestas and rockets) but she just sat in the back saying the mantra “I’m not scared. I’m not scared. I’m not scared”. She wasn’t scared. Aw….she had every right to be! 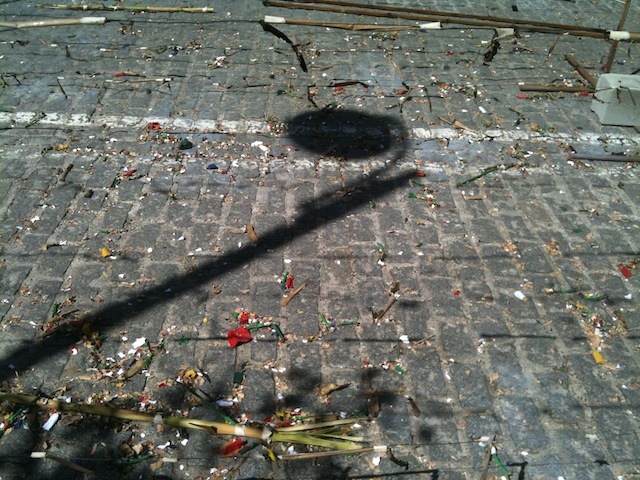 Been to Las Fallas and jar never heard anything like yesterday…enjoy the blue sky.